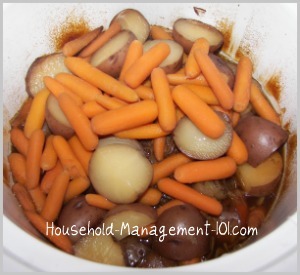 On busy days I use these crockpot pot roast recipes to make a delicious meal, with meat and vegetables, all in one, for my whole family. What I like about crockpot meals in general is the ability to place all the ingredients into it in the morning and open it in the evening and find a tasty meal. Of course, some crockpot meals take a good deal of preparation in the morning, such as browning meat, sauteeing vegetables, etc. to make them good. This crockpot pot roast recipe doesn't even require that -- just dump the ingredients in and go. You can, of course, brown it first if you want to, but adding the onion soup mix makes it unncessary, at least in my opinion. * We do not have a favorite cut, but just buy what is on sale. If you only buy the meat when it is on sale this recipe is also quite frugal. First, add the meat to the bottom of the crockpot, and sprinkle the two packets of dried onion soup mix onto the meat. Next, add the carrots, chopped onions and quartered potatoes. Do not cut the carrots or by the end of cooking they will basically have dissolved. If you leave them uncut they will be nice and tender, but still hold their shape. Finally, add 1 cup of water. It doesn't look like much water, but it makes the gravy very good at the end to be thick. With the onion soup mixes you don't need to add salt and pepper, because they are already included within the mix. Turn your crockpot on high for one hour, and then turn down to low if you have time enough in the morning to babysit it. Otherwise, just turn on low. Let cook for at least 7 hours, or a bit longer and at the end of the day come home to a well-cooked, tender piece of meat, and great sides to eat with them. Voila -- one of the easiest crockpot pot roast recipes out there, and it tastes awesome. We generally serve with wheat bread to help sop up the gravy, and if we have time also some green beans. There are also generally leftovers for you to eat the next day for lunch too! The beauty of this slow cooker roast recipe is that you can tweak it and add things to it to suit your family's tastes, quite easily. Just use it as a base and add and take things away. Some people add some Worcestershire sauce, others add cream of mushroom soup, beef broth, minced garlic, or other vegetables such as celery. Our family likes the recipe as is, but tweak it to suit your family's taste and enjoy a good hot dinner even on days when things are crazy around your home or at work. I by no means have the market on good slow cooker recipes. My friend Crystal has a site devoted to lots of easy dinner ideas. You can check out her slow cooker recipes for even more great ideas.